Padmasambhava (also Padmakara or Padma Raja) (Ch: 蓮華生上師; Tib: Padma Jungne), in Sanskrit meaning «lotus-born», founded the Tibetan or Tantric school of Buddhism in the 8th century. 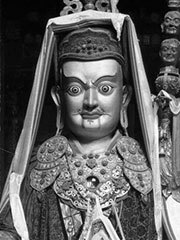 In Bhutan and Tibet he is better known as Guru Rinpoche («Precious Master») where followers of the Nyingma school regard him as the second Buddha. According to tradition Padmasambhava was incarnated as an 8 year old child appearing in a lotus blossom floating in Lake Dhanakosha, located in Swat in present-day Pakistan . His special nature was recognized by the local king who married him to one of his daughters, Mandarava. Mandarava and Padmasambhava’s other main consort,Yeshe Tsogyal, developed into realised practitioners. Many thangkasand paintings show Padmasambhava in the middle between them. Padmasambhava’s ability to memorize and comprehend esoteric texts in a single hearing established his reputation as a master above all others. Accused of the mystical killing of an evil minister, he was banished from the court and freely chose to live in a cemetery district. Transiting various heavens and hells, he developed the power to transcend the cycle of birth and death, accomplishing the so-called great transference.His fame became known to Trisong Deutson, the 38th king of Tibet (742-797), whose kingdom was beset by evil mountain deities. The king invited Padmasambhava to Tibet where he used his tantric powers to subdue the evil deities he encountered along the way, eventually receiving the Emperor’s wife, identified with the dakini Yeshey Tsogyel, as a consort. This was in accordance with the tantric principle of not eliminating negative forces but instead redirecting them to fuel the journey toward spiritual awakening. In Tibet he founded the first monastery in the country Samye Gompa, initiated the first monks, and introduced the people to the practice of Tantric Buddhism. In Bhutan he is associated with the famous Taktshang or «Tiger’s Nest» monastery built on a sheer cliff wall about 500m above the floor of Paro valley. He flew there from Tibet on the back of his favorite consort, Yeshe Tsogyal, who he transformed into a flying tigress for the purpose of the trip. Later he traveled to Bumthang district to subdue a powerful deity offended by a local king. Padmasambhava’s body imprint can be found in the wall of a cave at nearby Kurje Lhakhang temple. Schmidt, Erik Hein, and Marcia Binder, ed. 1993. The Lotus-Born: The Life Story of Padmasambhava. Composed by Yeshe Tsogyal, revealed by Nyang Ral Nyima Öser, foreword’ by Dilgo Khyentse Rinpoche, clarification by Tsele Natsok Rangdröl. Translated from Tibetan by Erik Pema Kunsang. 1st edition, Shambhala Books. Reprint: Rangjung Yeshe Publications, Boudhanath. 1998. ISBN 962-7341-35-4.